Party Tech is your one stop event solution. Why should you worry about co-ordinating various suppliers for that special occasion! Our team of professionals will customise your needs into an event to be remembered! From cocktail tables & chairs to couches and dance floors, we have what you need to turn that special occasion into a memorable one. Hire our new Infinity LED bar counters that can be made one colour or change colour! The company is run by Chad Johnson who has been in the events industry for over 20 years. Whether you are having people over to celebrate a special occasion or your company is planning an event. Party Tech will assist you with organizing parts of your event or arrange the entire occasion. 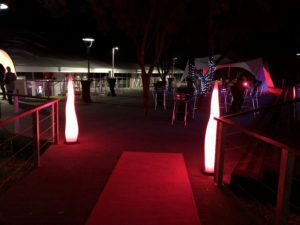 Great entrance feature for your next event!